Crescentic glomerulonephritis is also known as rapidly progressive glomerulonephritis. Crescentic glomerulonephritis may present with nephritic syndrome ( proteinuria and hematuria).The common complication of crescentic glomerulonephritis is renal failure. 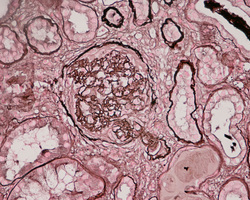 Crescentic glomerulonephritis may present with formation of crescent moon shape between the glomerular tuft and Bowman’s capsule. This occur due to the deposition of the fibrin in the Bowman space and proliferation of the parietal epithelial cells of the Bowman capsule. The complication of crescentic glomerulonephritis is renal failure. Crescentic glomerulonephritis may present due to immune type reaction such as IgA nephropathy, Goodpasture syndrome, Henoch - Schonlein purpura and Wegener granulomatosis. There will be immune antibodies against the glomerular basement membrane and immune complex deposition. Other causes include post streptoccocal infection or pauci immune type. The treatment of crescentic glomerulonephritis is dialysis and renal transplantation.